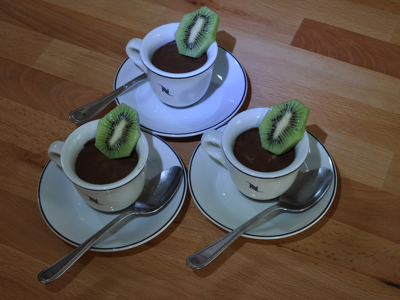 One of my favourite recipes when we have a glut of eggs is a mousse au chocolat taken (and changed slightly) from the book French Women Don't Get Fat: The Secret of Eating for Pleasure by Mireille Guiliano. I love this book; it was one of my Mum’s super finds that she bought for me when we first moved here in 2004. I really enjoyed reading it, learnt quite a few good healthy living tips from it and it has since become a treasured possession. At the time I did have a number of kilos to shift and the free flowing wine and cheese here in France wasn’t helping. I liked the case studies and the simple way she puts it – weight loss is no mystery you just have to balance what goes in with how much you move. Taking stock of what you eat and integrating movement into your daily lifestyle is key. I must admit being in France has helped us to do this; we now eat a lot more fruit and vegetables from the garden, all meals are home cooked and working in the garden and walking the dog means we do exercise without the hassle or expense of the gym. Things are a bit different from our previous life where an hour and a half sitting on a train commuting to London, all day sat at a desk then another hour and a half back on the train were normal. The thing I found most amusing however is that the one thing she keeps banging home is that French women don't waste money on gym membership as they are sensible enough to take the stairs rather than the lift and walk rather than go by car. A good idea definitely, but she has never been to my bit of France that is obvious. Our village is small, but all the French kids arrive at the bus stop by car, and if there is anything on at the salle des fêtes they all drive, needless to say some of the French ladies in the village could do with reading her book. Back to the important issue that is Mousse au Chocolat. Thanks to the fine weather and the fact I am collecting eggs from an extra 5 birds whilst feeding them for some neighbours who are away, we have enough for this moment of indulgence. Melt the chocolate in a large bowl set over a pan of simmering water. Remove from the heat, add the sugar and coffee, stir well and add egg yolks one at a time. Beat the egg whites until stiff, glossy peaks are formed. Gently fold the whites into the chocolate mixture until well blended. I like to serve in expresso coffee cups, so divide the mixture evenly between about 6 cups, leaving a gap at the top, cover with clingfilm and refrigerate overnight. Before serving add a couple of teaspoons of fruit compote to fill the cups. Ed likes to call it 'fruit surprise'.